So I went to the book store yesterday. I was hoping to pick up a book for my son, so I stopped off in a Barnes & Noble book retail shop. I’ve always liked Barnes & Noble because they have always had a decent collection of books and magazines. I don’t often go to book stores, truthfully, because I have a stack of books I still need to work my way through. Also, most of the books for my profession that I purchase are not available in retail stores. As such, it has been quite awhile since I just browsed a book store. The last time I did that probably in 2009 at Junkudo in Shinjuku. How things have changed at Barns & Noble! The first thing I noticed was the large in-store Starbucks. Back in 2003 the cafe would be just as packed, but no one would be buried in a laptop. Almost everyone would be browsing a set of books or magazines. The next large area that caught my eyes was the magazine rack. It occupied an entire wall of the store, and the various collections of magazines was impressive. No matter what your hobbies are, you’re likely to find at least one magazine to fit your interests. There are still not as many publications as one would find in Japan though. I suspect the reasons are 1) culture, and 2) lifestyle. I won’t get into the culture aspect here, but when you use public transportation you certainly have more time to read. The other two large sections were the children’s section and the audio/video section. The center of the store was stocked with books and there are a fair number of books even in this day of declining paper book publishing. I moved into the children’s section, and too my surprise, there were relatively few books. There were more puzzles, DVDs and games than books. I am going to have to give the local library a try for books for Liam. There are a few I’d like to buy, but otherwise the library probably has a better selection. I was specifically looking for Paddington Bear, but I could not find a single book. I asked a clerk and she chuckled, and starting searching only to prove her assumption right: not in stock. I asked her what’s the deal was and she said kids today prefer Disney. How sad! Disney has nothing on Padding Bear, Curious George, and Babar. For older kids, there were a lot of “graphical novels”, or in other words, manga (漫画), Japanese-style comic books, translated into English of course. I did not expect that. The most shocking section was the audio and video section. 7 years ago one would primarily find music, with around 50% dedicated to classical, jazz and world music. They had some pop music, but by and large you’d go to a shopping mall record store to get pop music. In 2011, over 50% is DVDs and Blue-Ray discs. There were more audio books than classical, jazz and world music combined. In fact, there were more movie soundtracks than classic music CDs. The majority of the music CDs were actually pop music. The lack of classical, jazz and world music was most shocking. In the past, the only place I knew where to purchase these genres of music was at Barnes & Noble. This seems to no longer be an option, however. I was looking for some Bach harpsichord recordings, but the majority of the Bach CDs were new-age collections with titles like “Back for Meditation”. I suppose that the only place to get such music is online via specialized music shops or through iTunes. After getting over the shock at how much things have changed, I’ve realized that I don’t really need to go into such book stores anymore. I will not find what I’m looking for, and be told to order on the Internet, so count me in as one of those responsible for the death of the traditional North American book store. In North America, in the end, I suppose bookstores will only thrive as specialty book stores in dense urban areas, such as literature and political themed shops in Washington DC and technical-oriented shops in Silicon Valley. Book stores that organize community events such as discussion groups and readings will also thrive. Another plus to urban living…one day we’ll get there. It’s been awhile since the last post. Since starting graduate school in the evenings, that, on top of work full-time has kept me very busy. I suppose that is for the best because it is winter in Charleston, which means it rains, rains, rains and rains. No time to enjoy the good outdoors in the cool weather I’m afraid. Tonight I was in the mood for cooking, so I decided to make a Hunan-style dish called “Chairman Mao’s Red-Braised Pork” (毛氏红烧肉). According to Fuchsia Dunlop, this is a dish that Chairman Mao Zedong craved even while living in Beijing. There is nothing too exotic in the dish: pork, sugar, cooking wine, ginger, chili peppers, soy sauce and cassia bark (or cinnamon, which I used). I made it rather mildly tonight, next time I will add more chili peppers to give it a real kick. The color, believe it or not, comes from caramelizing sugar in cooking oil and cooking wine–it is not due to additives. After making this, I definitely need to do more exploring with Hunan cooking. 1) Heat oil at a lower temp in a wok, then add sugar and wait for it to melt, then raise the temp and stir the sugar until it caramelizes. 2) Add the pork and then add about tbsp of cooking wine (I just used Japanese cooking sake, I did not have Shaoxing Chinese cooking wine) on top of the pork — try to avoid dumping it on the wok itself…I did that and cleanup was fun afterward. 3) Add water enough to cover the pork, then add the ginger, chilis, cinnamon stick, and any other spices you fancy. The recipe calls for exotic ones like star annse, but I don’t have any. I suppose you could also add paprika to get an even better red color. Give it a good stir to mix it all up. 4) Bring it up to a boil, and then return it to a simmer for 40 minutes. 5) After the time has passed, turn up the heat to boil away the the sauce. Splash a little soy sauce and sugar for flavor. I also added some corn starch to thicken the sauce. 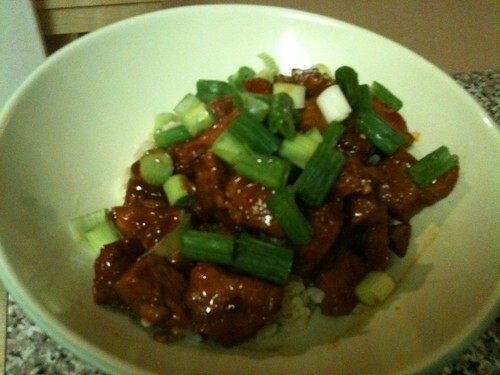 6) Top with scallions for flavor and garnish just before taking it off the heat.